The chief of the new Devon and Somerset fire service says that the brigade's focus will be on providing locally-based responses to emergencies. 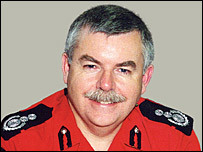 Paul Young said the new brigade would become the largest non-metropolitan fire and rescue service in the country. But he added that fire crews responding to call-outs in their own communities from their local stations would remain the foundation of the service. The new combined brigade comes into effect from 1 April. The merger will create the sixth largest fire and rescue service in England and Wales, with a frontline service of almost 2,000 uniformed staff and 220 non-uniformed support staff. It will operate from 82 fire stations across the two counties, including 67 retained stations, the largest number of retained stations and retained firefighters in the country. Chief Fire Officer Mr Young said the merger would mean the new brigade would be able to produce financial benefits through economies of scale. But he added that it would also be a move that would more effectively safeguard its local presence while being better equipped together to deal with major emergencies. He said: "I am confident that the combination will allow the Devon and Somerset Fire and Rescue Service to increase the quality and quantity of work it is able to carry out without placing an additional long-term burden on council tax payers. "We need to create the resources to not only provide the best possible emergency response but also to continue increasing the delivery of more community safety initiatives which can prevent incidents happening in the first place." Mr Young confirmed that there would be no fire station closures, no reduction in frontline fire engines or firefighters and no compulsory redundancies as a result of the combination.